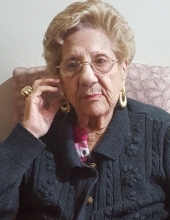 Jennie Demyon, 95, of Dania Beach, FL entered into God’s care Sunday, Jan. 27. Born in Troia, Italy, she resided in the Trenton/Hamilton area since the age of 3, prior to moving to Robbinsville in 1966 and Florida in 1983. Jennie was a former member of St. Gregory the Great Church. She was past president Deborah Hospital Chapter for 12 years in Florida. Jennie was also the president of her condominium building association for 20 years, and she was president of the Meadowbrook Lakes Condominium Association Phase III complex of 6 condominiums for 16 years. Predeceased by her parents, John and Clementine (Verrocca) Castranova, her siblings, Michael Castranova, Mary Genovesi and Ann Guadagno and her husbands, Joseph Tarantino and Joseph M. Demyon Sr.
3816 East State St. Ext., Hamilton. Visitation will be held at the church from 9:30 - 10:45 AM Monday. Burial will follow in St. Mary’s Cemetery of the Assumption #2 Hamilton, NJ. Memorial Contributions maybe to a charity of the donors choice. Arrangements are under the direction of the Blackwell Memorial Home, Pennington. To send flowers or a remembrance gift to the family of Jennie Demyon, please visit our Tribute Store. 3816 East State St. Ext. "Email Address" would like to share the life celebration of Jennie Demyon. Click on the "link" to go to share a favorite memory or leave a condolence message for the family.